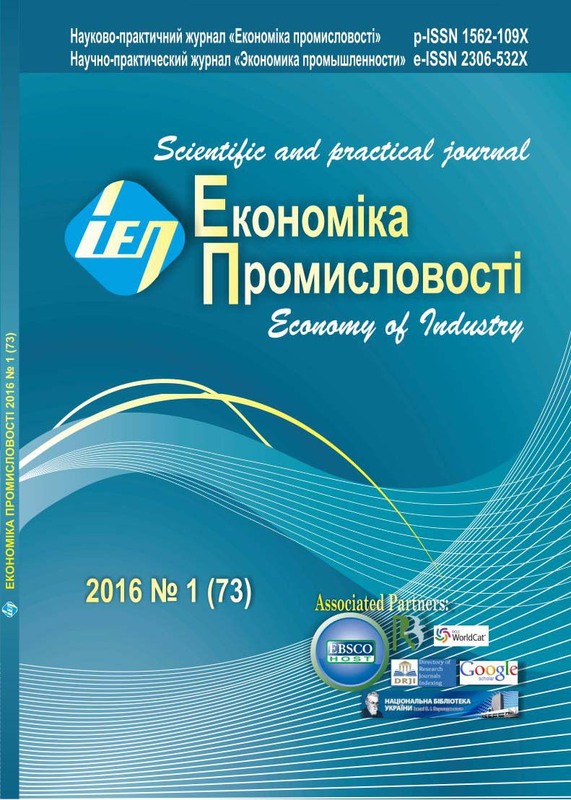 Scientific and practical journal “Economy of Industry” was founded in 1998 by the Institute of the Economy of Industry of the NAS of Ukraine. 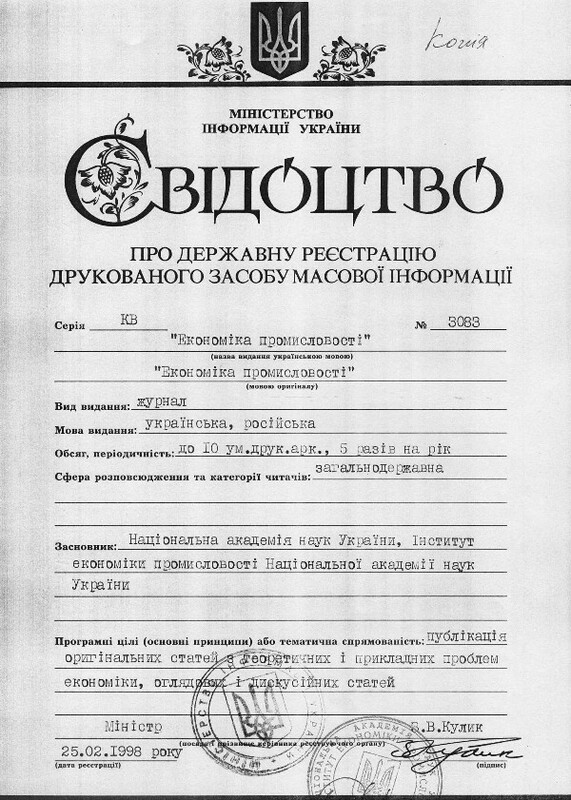 Certificate on state registration КВ № 3083 issued on 25.02.1998. The journal is included in the List of specialized scientific editions of Ukraine (Presidium Decree № 1-05/03 of the Higher Attestation Commission of Ukraine dated 08.07.2009). The Journal is numbered ISSN 1562-109X (Print), ISSN 2306-532X (Online). Journal materials are focused on informing the academic community, experts, local and national government representatives, and everyone else interested in research about the trends in modern science progress, economic and industrial policy problems and ways to overcome them, based on a thorough scientific analysis of the theory and practice of Ukraine and leading foreign countries, as well as economic and mathematical calculations. 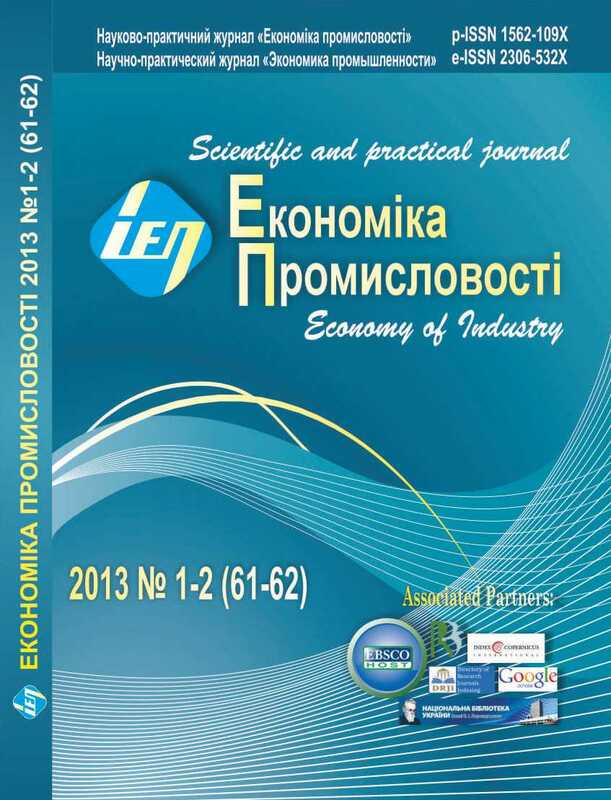 Journal publications aim at promoting implementation of original research results into Ukrainian economy. - investment and innovation processes in industry. - modelling the development of an industry, problems of informatization and modern IT. - reserves of the improvement of the effectiveness of industrial enterprises and manufacturing complexes. - protection of labour management, problems of safe living. Periodicity of our magazine: 4-5 times per year. The Journal is indexed in the search engine Google Scholar. The periodical is offered also in to the global electronic library of science periodicals EBSCO and in to the Ulrich's Periodicals Directory. Since 2013 the journal is indexed in the Scientometric Databases: DRJI (Directory of Research Journals Index) and in the Research Bible (Tokyo, Japan).